***N. B. Whereas in the last Dying Speech of the Malefactors, who were executed on Monday the 12th of February last, several literal Mistakes and other gross Errors, which perverted the Sense, escap’d Correction, through the Hast of the Press: The Readers are hereby desir’d to excuse the same, and may be assur’d that effectual Care shall be taken to prevent the like for the future, by printing the Dying Speeches correctly. AT the King’s Commission of Oyer and Terminer, and Jail Delivery of Newgate, held (before the Right Honourable Sir EDWARD BECHER, Lord Mayor of the City of London; the Honourable Mr. Baron Comyns; the Hon. Mr. Justice Probyn; the Hon. Mr. Baron Thompson, Recorder of the City of London; and John Raby, Esq, Serjeant at Law; and others his Majesty’s Justices of Jail Delivery, and Oyer and Terminer aforesaid: Together with several of his Majesty’s Justices of the Peace for the said City of London and County of Middlesex) at Justice-Hall, in the Old-Baily, on Wednesday, Thursday, Friday, Saturday, Monday, and Tuesday, being the 28th and 29th of February, and the 1st, 2d, 4th, and 5th of March, 1728. in the first Year of his Majesty’s Reign. Six Men, viz Benjamin Branch, Martin Bellamy, William Shann, John Potter, James Stagles, alias Howard, and Richard Kelme; and two Women, viz. Margaret Wallis, alias Staineus, and Margaret Murphy, were found guilty of capital Offences by the Jury, and received Sentence of Death. While under Sentence, they having been for the most part young People of lewd and dissolute Lives, and consequently ignorant of Religion, both in Speculation and Practice, were instructed in those Principles, which are necessary to be known by us, both as Men and Christians. I shew’d them, that Nature itself teacheth us, that unto God the Sovereign Lord of the Universe, Worship, Reverence, and Homage is due from all his Creatures, and that Man who (as the Heathens, who were only led by the light of Nature, acknowledged) was form’d after the divine Image, and substituted Lord of this inferior Orb, was in a more especial Manner bound, in Token of his dependance, to give all due Obedience, by dedicating himself to the Service of God, his Creator and special Benefactor. But if they fell short in complying with the first Principles of natural Religion, which is insufficient for Salvation; how much greater must their Guilt be, who being descended of Christian Parents, and living in the midst of so great Light, had despised those glorious Revelations, which were intended to elevate and perfect our depraved Nature? That Theft and Robbery were destructive of all human Society, and reduc’d Man, who is made after the Image of God, who is the God of Order, into the State of savage Animals and Birds of Prey. Besides, that the Commission of the Sin of Theft and Robbery was attended with innumerable other, the worst of Sins; such as a tendency to Murder, and commonly a continued Practice of Lying, Drinking, Whoring, and many such like Vices; and it is evident, that those who give themselves up to this wicked Course of Life, are the vilest Wretches, and abandon’d to every thing which is good. I instructed them in the Nature of the Christian Sacraments, both of Baptism and the Lord’s Supper, how they are Seals of the Gospel-Covenant, and Pledges of all those Blessings procur’d to us by the Sufferings and Death of our Lord Jesus; and that the Lord’s Supper was a proper Provision to strengthen our Faith, in order to prepare us for a new State of Life, and that never-ending Eternity, upon which they were to enter. While these and the like Exhortations were us’d, John Potter, James Stagles, Richard Kelme, Margaret Murphy, and Margaret Wallis, alias Staineus, were apparently devout and serious; Benjamin Branch, and Martin Bellamy comply’d with the Worship, by making regular Responses, but were seldom attentive to the Exhortations, and were otherways guilty of carrying themselves most undecently at Prayers and other Times, especially for Men in their miserable and dangerous Circumstances; for which I reprov’d them sharply and frequently; but they were the most obstinate and obdurate Criminals I ever saw. William Shann never came to Chapel but once, having been afflicted with sickness, and afterwards with swelling in his Legs and Feet, so that he could not walk; but as I frequently visited him in the Cell, he still declar’d himself very Penitent, and readily comply’d with Prayers and Exhortations. Upon Thursday, the 21st, of March, the Report of these eight Malefactors under Sentence of Death, was made to His Majesty in Council. When William Shan, for Felony and Burglary, in breaking the House of Richard Wright of Coleman-street, and taking thence 30 Guineas, 10 l. in Silver, 8 Moiders, 2 broad Pieces, and one half broad Piece, on the 8th of December last, the Property of Richard Wright aforesaid. And Richard Kelme of St. John Hackney, for stealing a Brown Gelding, value 7 l. the Property of Mr. Yellowly; a Mare, val, 7 l. the Goods of Mr. Sanders; a Bridle, Saddle, and Saddle-cloth, the Property of John Laurence, out of the Stable of the said John Laurence, receiv’d His Majesty’s most Gracious Reprieve. The remaining Six, viz. Benjamin Branch, Martin Bellamy, John Potter, James Stagles, alias Howard, Margaret Murphew, and Margaret Wallis, alias Stainens, were ordered for Execution. Benjamin Branch, of St. Andrew’s Holbourn, was Indicted for Assaulting Jane Marshal on the Highway, putting her in Fear, and taking from her two Guineas, two half Guineas, and 3 s. and 6 d, in Silver, 2 Pocket-pieces, value 5 s. a bunch of Keys, and 2 silk Handkerchiefs, on the 27th of Jan. last. Benjamin Branch, 27 years of Age, descended of honest Parents, who gave him good Education at School, in Reading and Writing, and instructed him in the Christian Religion: When of Age, they put him to an Employment, at which he might have liv’d well; but being of a loose Temper, and not willing to confine himself to constant Business, he Associated himself with the worst of Company, and commenc’d Thief and Street-Robber in an extraordinary Manner, surpassing most of his Accomplices in those unlawful and wicked Practices. He confess’d, that he had committed many Street-Robberies, and particularly that for which he was Convicted, that he met with a deserved Punishment, having Sin’d against much Light and Knowledge, and the Convictions of his own Conscience: For his Father (as he said) bred him to his own Business of a Goldsmith and a Lapidary , and put him in a way of living Creditably in the World, but shaking off all fear of God and Regard to Man, and joining himself to a Band of Thieves and Robbers, he became one of the most Noted about Town in that way. He always attended publick Prayers in Chapel, and made Responses regularly, but with too much Indifferency, and for the most part was attentive to the Exortations, only sometimes he spoke to his Friends, and some who were next him. And upon the second Sunday before his Death, he and Bellamy, as I began to speak upon Death, which I judg’d a proper Subject and Discourse for their Case; went out of their Place to talk with Strangers; this giving offence to the Auditory, I desir’d them to return and compose themselves, and hear the Word of the Lord with Reverence and Attention; they were so rude as to cry out, expressing themselves in a very undiscreet Manner, before a good number of People, a Behaviour unbecoming any Person, but especially Men in their deplorable Circumstances. I reproved them sharply, and told ’em, that however they might slight the Ordinances dispens’d by Man, yet that God the righteous Judge, who was ready to take Vengeance upon his Adversaries, would shortly bring them to a terrible Account for so notorious Contempt of his Word, if they did not repent. I have not observ’d two so very audacious Sinners, when so near their latter End. When the Report was made, Branch became more serious and civil, acknowledging himself to have been one of the greatest of Sinners, most unthankful to God and Man, for the great Blessings he had receiv’d, and for misimproving the Talents where with God had endow’d him; adding, that his sometimes laughing and speaking proceeded not from any Contempt of God’s Word and Ordinances, but from his Youth and want of Consideration. He declar’d himself penitent for all his Sins, particularly, his great Vices of Covetousness, Robbery, Whoredom, and their Attendants, which had brought him to a shameful and untimely Death; that he died in Peace with all the World, and in the Faith of being sav’d only through the Merits of Jesus Christ. Martin Bellamy, of St. Katherine Cree Church, was indicted for Felony and Burglary, in breaking the House of Giles Holliday, on the 5th of February last in the Night time, and taking thence 12 Pounds of sewing silk, Value 10 l. and 20 pair of worsted stockings, Value 5 l. the Property of Giles Holloday aforesaid. Martin Bellamy, born of honest Parents, who gave him good Education, instructing him in Christian Principles, and the Knowledge of other things proper to fit him for Business in the World. He was about 28 Years of Age, by Trade a Taylor, in which Art he was very skillful, and might have liv’d in Credit and an honest manner, but giving loose Reins to his irregular Passions, he addicted himself to all manner of Wickedness. About 4 Years ago, he married and liv’d only 5 Weeks with his Wife, for being taken up for some Fraud or Theft, he was put into Clerkenwell Bridewell, whether (as he said) his Wife’s Brother-in-Law coming to him, desir’d to know, where his Prosecutor liv’d, upon Pretence of making Matters easie, but the said Brother went to the Gentleman and advis’d him to prosecute Bellamy; upon which he resenting this suppos’d Injury, took up an irreconcileable Prejudice against his Wife and all her Relations, never cohabiting with her any more. About this time, he betook himself to his old Companion a young Woman, whom he call’d Amey Fowler, who pass’d for his Wife above the space of six Years, bare him several Children and liv’d in good Friendship with him. Her he commended, though (it seems) he could by no means agree with his true Wife, because she disapprov’d of his naughty Courses. He said also, that Amey Fowler was altogether ignorant of and had no Concern in his Robberies, he having deserted her Company also, when he follow’d that extravagant manner of Life. This he desir’d to be publish’d, because the World blam’d her for his Misfortunes, as advising him to undertake his villainous Attempts. He gave Account of a great many Robberies and Burglaries he had committed; such as, his obliging the Watchman in Thames-street to throw his Lanthorn and Staff into the River, and holding a Pistol to his Breast, till three other Thieves robb’d a Tea-shop to the Value of 20 l. in Goods. In East-Cheap he robb’d a Shoemaker’s Shop, and knock’d the Watchman down with a bag of Shoes, which he was forc’d to leave out of hast to make his Escape. In Coleman-street he robb’d a Stocking Shop of Goods to the Value of 70 l. He robb’d a Gentleman near St. Botolph’s Aldersgate of a silver Watch with a Case, but left him 6 s. in Money, and cut the Band of his Breeches, to prevent his pursuing him. For a little Premium to support himself in Prison, he put some upon a way of recovering part of their Goods. Some Years ago, upon a false Pretence, he got 10 Guineas from one in Smithfield, in the Name of the late Jonathan Wild, but made his Peace with Jonathan, by giving him 5 l. and gave his Bond for Payment of the Money at the Baptist-head Tavern, but this is still unpaid. Many such Accounts he told of himself, but with such an air of Indifference and Boldness, as shew’d him to be no way penitent for his Crimes, but to take Delight in recounting his Villainies, and thus glorying in his Shame. Altho’ he outwardly comply’d with Prayers, yet at other Times he behav’d himself with such Audacity, sometimes falling out into violent fits of Passion and Swearing; so that he seem’d to have been Craz’d and out of his Senses, not allowing himself time seriously to think upon his latter End, and improving his few remaining Moments, in working out his Souls Salvation with Fear and Trembling: Till some time after the Dead-Warrant came out, he began to Cry and Lament his unhappy Fate; his Conscience then beginning to Awake, because of the most irregular Life he had Led, and the terrible Account he had to make. I frequently and sharply Reprov’d him for his Miscarriages, and for his former vicious Life, having giving himself wholly up to work Wickedness. I represented to him the dangerous Condition he was in, what a terrible Thing it was to fall into the Hands of the living God, of a Just and Sin-revenging God; For who can abide with ever lasting Burnings? And that without holiness no Man can see the Lord. He acknowledg’d himself one of the greatest of Sinners; beg’d God and Man Pardon for the many Offences of his Life, declar’d himself Penitent for all his Sins; that he believ’d in Christ, through whose Merits he hop’d to be Saved; and that he Died in Peace with all the World. Branch and Bellamy own’d themselves much oblig’d to two worthy Divines, who visited them three or four Days before they Died. James Stagles, alias Howard, of St. Dunstan’s Stepney, was Indicted for Assaulting John House on the Highway, putting him in Fear, and taking from him two Pocket Pieces, val. 6 d. 6 s. in Silver, and some Half-pence, on the 6th, of February last. James Stagles alias Howard, 43 years of Age, (as he said) descended of honest Parents, who gave him good Education, and instructed him in Principles of Christianity. When of Age, he was not put out to any Employment, but served Gentlemen, and married a Woman in Yarmouth, with whom he got a good Portion, which he prodigally squander’d and lavish’d away. He Travel’d over great part of the World, Italy, France, the Holy-land, and several other Countries, attending his Masters, and could speak some Foreign Languages; and when he came home (as he said) he was worth some thousand of Pounds, which he spent in his foolish Rambles; he purchas’d a Place for himself, which he lost because of his Miscarriages. Being out of Business, and not knowing what to do, and wanting Grace and good Manners, he took himself to the Highway, for two or three Years past; during which time, he was not Inferior to any of his Profession in doing Mischief. He had formerly made himself an Evidence against one George Noble, who was Executed at St. Edmund’s-Bury, who deny’d the Fact of which he was Convicted, at his last Hour. Upon a Letter from an unknown Hand at the desire of Noble’s Widow, I ask’d, if Noble was guilty according to his Evidence? He answer’d, that it was known he was Guilty, and that his Wife need not enquire into that Affair, knowing the Truth thereof. As to the Robbery of which he was convicted, he denied that he took the Money from the Gentleman, but that it was handed to him by another Person, who is a creditable Man, but whom he did not incline to discover, thinking he should not have been Convicted, and after Conviction it being to no Purpose, he did not judge it proper to ruin a poor Family. He confess’d himself to have been a most wicked and profligate Fellow, and that he had met with a deserved Punishment for his Crimes. Although (as he said) when he was abroad, he was sollicited to alter his Profession, as to Religion, which indeed I believe was, what he least minded, yet he was still of the Communion of this Church, in which he was Baptized. He declar’d himself sincerely penitent, having always behav’d himself very devoutly at Prayers, but that sometimes he spoke to Branch, that he believ’d in Jesus Christ his only Saviour, and died in Peace with all the World. Margaret Murphey, of St. Martins in the Fields, was indicted for privately and feloniously stealing out of the House of John Cordes, a Silver Salver, val. 5 l. a Silver Tea-pot, val. 5 l. on the 15th of January last, the Property of Peter Casteels. Margaret Murphey, 30 Years of Age, born in Ireland, of honest Parents. Her Father dying when she was very young, she got little Education, and if she was put to School, what Instructions were given her were quite obliterated, by Reason of her perverse and wicked Nature. She married a Husband in her own Country, and came over to London 9 Years ago, where she kept House for some time, and as one who liv’d near her, told me, maintaining a good Character among the Neighbours. But (as she told me) her Husband was a very naughty Fellow, and made all away in a most profuse and extravagant Manner, which made her rack her Wit what Course to take, and falling in with ill-dispos’d People, they brought her into Acquaintance of some of Jonathan Wild’s Gangs, which prov’d her Ruin. She voluntarily appear’d as Evidence against Jonathan Wild, who was convicted upon her Evidence chiefly; and upon the desire of one, being ask’d, if the Evidence she gave against Jonathan was True as she deliver’d it? She answer’d, that it was, and several Persons knew it to be so, and that there was no Force put upon her in that Affair, she appearing of her own accord. She own’d herself to have been a very great Sinner, to have liv’d a most irregular and debauch’d Life, to have been concern’d in a great Number of Robberies and Felonies, having for some Years past liv’d upon what unlawful Purchase she could make that way, and to have met with a most deserved Punishment for the Villainies she had committed. As to the Crime of which she was convicted, she said, that she never saw the Silver Tea pot which was sworn against her, and she only got the Salver from another Woman to sell, who never told her what way she came by it; to make this appear probable, she said, that she did not know Mr. Casteels in Long-Acre, having never heard of him, nor his House. But that it was her great Misfortune to be under so bad a Character, because of her Acquaintance with the late Jonathan Wild, and her appearing as Evidence against him, which made her Name still more infamously Famous. I desir’d her to submit to the Will of God, since Providence had justly brought her under severe Afflictions, and the Lash of an ignominious Death for her reprobate and unaccountable Life. She acknowledg’d the Justice of her Sentence according to the Laws of the Land, declaring that she believ’d in Jesus Christ her only Saviour; that she repented of all her Sins; dying in the Romish Communion, and in Peace with all Mankind. Margaret Wallis, alias Staining, was Indicted for breaking the House of Henry Clark of Islington, on the 3d, of February last, in the Night-time, and taken thence 12 Pewter-plates, a Napkin, 5 Handkerchiefs, 4 Aprons, a black and white Silk-hood, a Mob, 3 holland Shirts, 2 pair of Stockings, a Top-knot, a Wrapper, 2 Gowns, six holland Shifts, a Petticoat, a Fann, a pair of Lace-Ruffles, and a Remnant of brocaded Silk. Margaret Wallis, alias Staining, 21 years of Age, of mean Parents in the Country, who gave her no Education. She always serv’d Honestly (as she said) except in the particular instance of this Robery for which she died. She was a very ignorant Creature. I instructed her in the first Principles of Christianity, and with difficulty brought her to a little Knowledge. Altho’ she was Sick most of the time she was under Sentence, excepting two or three times, she always attended in Chapel, and to appearance, with abundance of Devotion and Seriousness. She own’d herself guilty of the Robbery of which she was Convicted, and that her Sentence was just according to Law. She declar’d, that she was truly Penitent for her many Sirs, that she believ’d to be Saved thro’ the Merits of Jesus Christ, and Died in Peace with all Mankind. THEY all behav’d with very great Seriousness and Devotion, to appearance. James Stagles, alias Howard, desir’d me to write down to the Country, and give a near Relation of his an Account of his deplorable Fate, to communicate the same to the rest of his Friends. Mrs. Murphey declar’d, that she knew nothing of Mr. Casteels nor his House, who swore himself Proprietor of the stollen Plate for which she died; that she knew of no more then a Salver, which was given her by another Woman to dispose off, and this she knew to be stollen, but from whence she could not tell. As for the Tea-pot, she never heard of it. She said also, that she knew nothing of his Grace the Duke of Montague’s rich Hangings, and that the Woman, nam’d Sullivane, swore falsely against her, for which she freely forgave her, and prayed God to forgive her. They all adher’d to their former Confessions, and went of the Stage, crying out, Lord Jesus receive my Spirit. Just as the Prisoners were bringing out of Newgate, to go to the Place of Execution, a Reprieve came for John Potter, before-mention’d. I Am brought here to suffer an ignominious Death, for my having willfully transgressed against the known Laws of God and my Country. I fear there are too many here present, who come to be Witnesses of my untimely End, rather out of Curiosity than from a sincere Intention to take Warning by my unhappy Fate. You see me here in the very Prime of my Youth, cut off like an untimely Flower in a rigorous Season, thro’ my having been too much addicted to a voluptious and irregular Course of Life, which has been the Occasion of my committing those Crimes for which I am now to suffer. As the Laws of God, as well as Men, call upon me to lay down my Life as justly forfeited, by my manifold Transgressions. I acknowledge the Justice of my Sentence, and I patiently submit to the same, without any Rancour, Ill will, or Malice, against any Person what soever, hoping, thro’ the Merits of Christ Jesus (who laid down his Life for Sinners, and who on the Cross pronounc’d a Pardon for the repenting Thief under the Agonies of Death) to be with him admitted to partake of that Glorious Resurrection and Immortality, he has been so graciously pleased to promise to the sincere Penitent. I earnestly exhort and beg of all here present, to think seriously of Eternity, a long and endless Eternity, in which we are to be rewarded, or punish’d, according to our good or evil Actions in this World, that you will all take Warning by me, and refrain from all wilfull Transgressions and Offences; let a religious Disposition prevail upon you, and use your utmost Endeavours to forsake and flee from Sin, the Mercies of God are great, and he can save, even at the last Moment of Life; yet do not therefore presume to much, least you provoke him to cast you off in his Anger, and become fearfull Examples of his Wrath and Indignation. Let me prevail upon you to forget and forgive me all the Offences and Injuries I have either committed, or promoted, in Action, Advice, or Example, and intreat your Prayers for me, that the Lord would in Mercy look down upon me in the last Moments of my Life. JAMES GUTHRIE, Minister at Newgate. 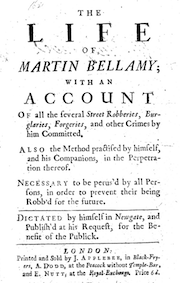 The LIFE of Martin Bellamy, with an Account of all the several Robberies, Burglaries, Forgeries, and other Crimes by him Committed. Also the Method practised by Himself, and his Companion, in the Perpetration thereof. Necessary to be Perus’d by all Persons, in order to prevent their being Robb’d for the future. Dictated by himself in NEWGATE, and Publish’d at his Request, for the Benefit of the Publick. And his Speech to the Spectators at the Place of Execution. Printed and Sold by J. Applebee, in Black-Fryers, A. Dodd, at the Peacock without Temple-Bat, and E. utt, at the Royal Exchange. Price Six-Pence. London: Printed by JOHN APPLEBEE, in Black-Fryers.